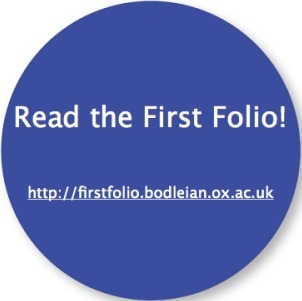 This entry was posted in Bodleian Library, First Folio, Sprint for Shakespeare, Victoria Buckley and tagged digital facsimile, First Folio, Sprint for Shakespeare by Sarah Barkla. Bookmark the permalink. Today, to celebrate Shakespeare’s birthday, I read Charles and Mary Lamb’s Midsummer Night Dream (in Italian) to my students, inmates at a juvenile prison, and it was the first time they listened to something without interrupting it every moment. Then I came home and found this beautiful present of yours. Thank you so much! Thank you so much for letting us know you like the facsimile, and about your teaching, which sounds wonderful. If you are able to write a little more about your Shakespeare work with students, or your students’ thoughts and reactions to Shakespeare, we would love to hear about it. Did you know we publish guest posts on the project’s blog: http://shakespeare.bodleian.ox.ac.uk/2012/07/12/many-voices/? Please tell us if you use the facsimile in your teaching!